In the Marines, supply administration and operations specialists (MOS 3043) perform technical duties in retail and wholesale supply accounting within every Marine Corps unit. Supply administration and operations specialists operate personal computers, and complete tasks, such as technical research functions for customer inquiries, multimedia data entry, scanning and retrieval system functions, generation of routine reports, and requisition and procurement processing. In addition, these Marine specialists maintain and prepare necessary accounting and supply documents, and custody records. They also perform reconciliations and ensure corrective action in a timely manner of any identified problem areas. Supply administration and operations specialists are also responsible for solving data output interpretation problems and contacting appropriate sources to resolve questionable areas. Must possess a GT score of 110 or higher. Complete the Enlisted Supply Basic Course, MCSSS Camp Lejeune, NC. No convictions by court-martial, civilian courts, or nonjudicial punishment of any act involving larceny or theft. Supply administration and operations specialists are one of several opportunities in the Marine Corps supply field. Other jobs include those that deal with, warehousing, packaging, handling hazardous materials, fiscal accounting and purchasing. 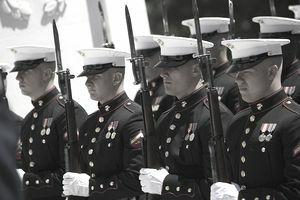 After recruit training, Marines in the supply field will complete the Enlisted Supply Basic Course offered at Camp Lejeune, N.C, according to the U.S Marines. A Supply Platoon is the central storage and distribution point for the majority of supply line items, such as repair parts, fuel, rations, and clothing for marines on deployment or at a base. What Is The MOS 0211 -- Counterintelligence/HUMINT Specialist? What is an Unmanned Aerial Vehicle Air Vehicle Operator? How Do You Become a Satellite Communications Operator in the Marines?